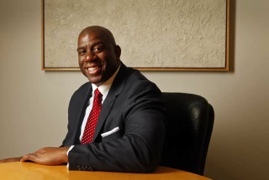 Magic Johnson was the talk of the town Wednesday after it was announced the former Lakers superstar and a group of investors will be the new owners of the Dodgers after paying a record $2 billion. The Lakers legend joined longtime baseball executive Stan Kasten, movie executive Peter Guber and Mark Walter, chief executive officer of a Chicago financial services company. The purchase was announced Tuesday night in a joint statement by the new owners and the selling owner, Frank McCourt. “I am thrilled to be part of the historic Dodger franchise,” Johnson said in a statement. The announcement ended three years of turmoil that included a bankruptcy filing. The sale must be confirmed April 13 at a court hearing. The Dodgers last won the World Series in 1988, their sixth championship in half a century of O’Malley family ownership. The Johnson group would become the Dodgers’ third owner since the O’Malleys sold the team in 1998, following News Corp. and McCourt.